Joyner Holmes and Danni Williams earned All-Big 12 Conference Honorable Mention recognition. AUSTIN, Texas — Sug Sutton has been named First-Team All-Big 12 for this season. Sutton started every game in the regular season for Texas. She average 12.8 points a game and 5.3 assists. Holmes came back after missing the first eight games of the season to lead the team in rebounding and score 11.6 points a game. Williams, the graduate transfer from Texas A&M, is the leading three-point shooter on the team, with 63 threes. 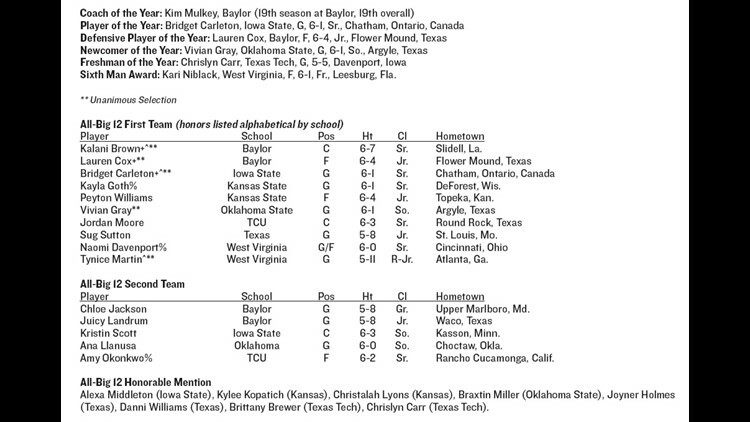 Baylor's Kim Mulkey is Coach of the Year and Iowa State's Bridget Carleton is Player of the Year.